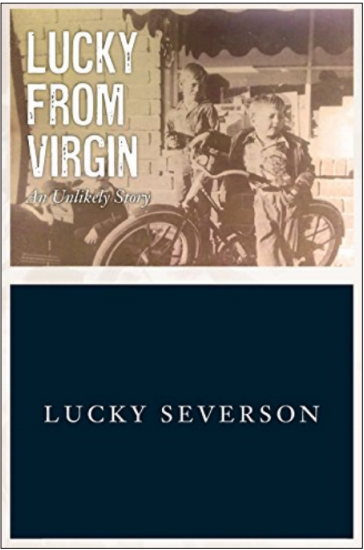 Lucky Severson’s new book Lucky From Virgin is a memoir of sorts, but not in the typical fashion. There is no overarching storyline detailing his life. It seems to be broken up into unrelated smaller stories about highly specific events and encounters in his years as a journalist and living in his hometown. This leaves the reader with an unclear understanding of whose stories they are reading, as Severson puts little of his own emotional spin on these stories. Rather, the book relies heavily on his most interesting journalistic assignments. And Severson had many fascinating assignments. Severson worked as an NBC correspondent, hosted the Discovery Channel show Invention and worked on PBS’s Religion and Ethics NewsWeekly. That explains why so much religion comes into play throughout the book. From Mormonism to Islamophobia in his Idaho hometown of Virgin, we get his take on different aspects of many different religions. At NBC he was “the man in Asia” as he says, reporting on China and North Korea. But this all left me wondering — what is the point? Severson’s journalistic assignments are interesting, no doubt, but why should I read about them here and not watch them online? This line and lines like it are common throughout the book to set the scene, but they provide no background details. We bounce from one topic to the next in a matter of pages. A good example of this is the “Preachers I Have Known” chapter. There are several names dropped — Dalai Lama and James Whittington, for example — that are only given a page-long explanation. This is a common theme throughout the book. Places or events only get short anecdotal stories. Severson’s main goal here seems to be “wowing” the audience with where he’s been, who he’s seen and how he got there. It became clear in the prologue that this is a storyteller who always had a video accompaniment. His opening scene is a story of his trip to the remote island, Pitcairn — wonderful place to begin a novel and perfect for relating it back to his own secluded town. But no. While these people are wildly interesting — their population is around 60 so, they’ve been inbreeding for generations — we never see them in the prose. They aren’t described at all but for the color of their skin. It’s almost as if the take-video cue could be written between the lines. Still, Severson finds angles for each story. In TV journalism, that’s the game: finding the most interesting aspect of Pitcairn and portraying it to viewers. But this doesn’t translate well into written work. That’s not how you tell nonfiction, memoir-like stories. Aside from relaying the most memorable trips or interviews, it’s unclear why Severson is telling these stories. Novels need more than an interesting story to be told. Nuances, connective plot devices and a message leaving readers with a sense of catharsis are needed — especially in a memoir. Authors of non-fiction memoirs need to work to show audience members why they should care about this particular life. This book doesn’t convince me I should care.